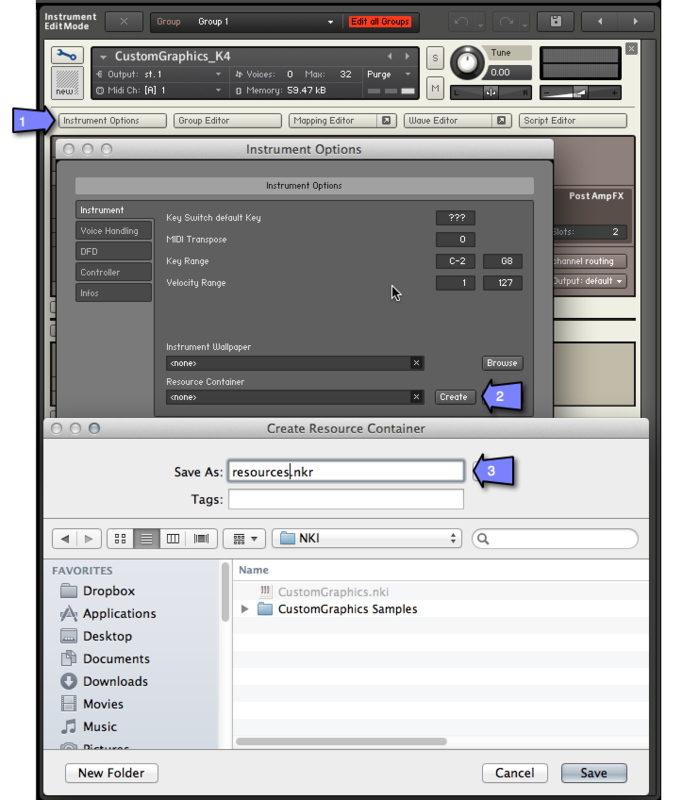 With custom controls and backgrounds, Native Instruments Kontakt allows you to create your own graphical user interface (also called GUI). When applied correctly, your instruments become more personal, playable and user friendly. This tutorial takes you through the steps required to create a background wallpaper and a custom graphical control in Kontakt. Along the way you’ll be learning to use the KSP script editor to apply the graphical elements and assign the custom knob to an internal control within the Kontakt engine. The background image should have a width of 633px and any desirable height between 68px (the height of the Kontakt instrument itself) and 608px (418px for Kontakt 4 and earlier). As an example, let’s create a background image in an image editor. Set the height to 164px and the width to 633px. Set the resolution to 72px/inch resolution. Kontakt will inform you that no picture, impulse response sample or script files have been added. Just click OK again. You will notice that the Resource selector field now points to the resurces.nkr file, but it also says ‘(Read from the “Resources” folder)’. This is just to inform you, that you now have a valid resource-file which could contain resources such as script files, other pictures and some IR-samples, but since a Resources folder structure now also exists, this will take precedence over the resource-file. This allows you to easily work with such resources directly in the folder structure without having to generate a new resource-file every time you change an image file etc. Such text files accompany any image file to be used in Kontakt – although the content may of course vary. The script for assigning the wallpaper looks like below. I recommend using a simple text editor (such as Notepad++ for Windows or TextWrangler for Mac – both are free and offers significant improvements over the standard text editors that come with either Operating system). You may also find Nils Liberg’s dedicated KSP editor/compiler very useful. It’s also free. Unfortunately the Mac port does not run so well, so I haven’t used it much myself. Save the script as script1.txt in the scripts folder inside the Resources folder. With this in place, it’s time to go to the Script editor so we can implement the graphics. Open the script editor and enable editing like this: What you see here is a blank script. Each of the “<empty>” tabs represent a script, so as you can see, it’s possible to have 5 different scripts running at the same time, for each instrument. Since we are not using the internal editor for maintaining the script, you need to tell Kontakt to apply the script from the Resources folder. Do this by clicking “Apply from…” and select “Resources folder” -> “script1“. The Apply lamp will now glow, indicating that you have unapplied changes. Click the Apply button to effectively apply the script. With the example image I created, the instrument now looks like this – very beautiful, right? Next we need a custom knob. The knob itself is an image file, consisting of all the individual ‘frames’ that make up the entire animation (moving the knob from its minimum position to its maximum position). Sure you can make this yourself, but since I’m a lazy guy, what I’ve been doing is to go to the knobman gallery and just pick the knob I wanted – there are plenty to choose from. There’s also an excellent online knob generator, so if you’re into that kind of work, you can easily create your own knob using this tool. Either way, what you’ll end up with should be a .png image file consisting of say 101 frames below each other, starting with the minimum position as the first (uppermost) frame. As an example, here’s a rendered version of one of the free knobs from the gallery. Did you notice how the file is supposed to end with an empty line? For some reason this is required, so do not miss it 🙂 Also, always make sure to save text files with UTF8 encoding and unix line breaks – that’s the safest options. It’s also best practice to avoid spaces and special characters in any filename – just stick to a-z, 0-9, dot . underscore _ and hyphen – and you should be safe. With the knob graphics in place, it’s time to extend the script. Kontakt has several built-in controls such as text displays, drop downs, buttons, knobs and sliders. Since there’s no such thing as a “custom graphic” controls, what we need to do is to add a slider, and then hide the slider’s own parts and add the picture we just saved. Below is the script you will need. Place it inside the on init / end on block of script1. Ok, we’re almost there. We just need to assign the button to some meaningful parameter in order to adjust the sound. Let’s say we would like to adjust the pitch of the first group of the instrument. 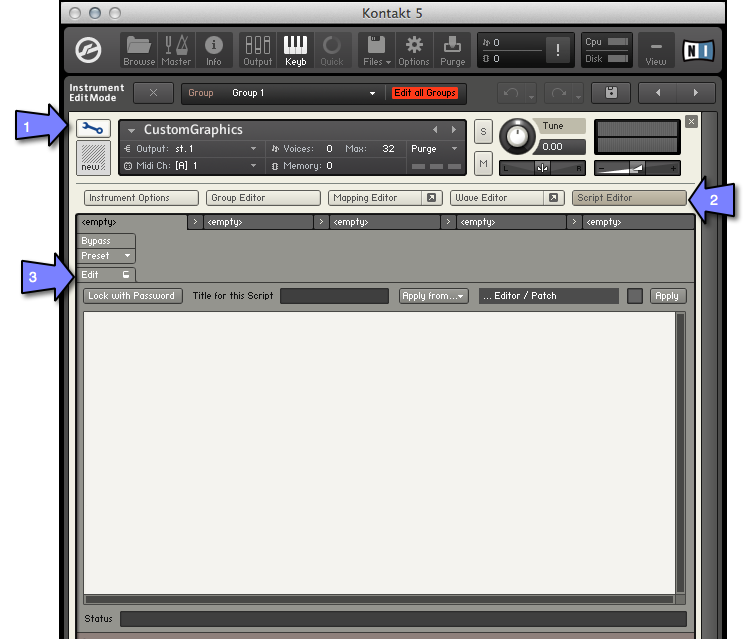 This completes this tutorial on adding custom graphics to the Kontakt performance view. Please find all the necessary reference documentation in your Kontakt Documentation folder – there’s a whole manual just for KSP. I hope you found this tutorial useful. For my own part I found it very hard to gather all the little pieces of necessary information in order to be able to produce something like this. Thank you soooo much for this Tutorial, now i can do my own knobs in my futured works. the tutorial helped me a lot! Thanks so much for creating and posting this very well done tutorial along with the actual instrument. I learn best by looking at and into the examples of others and yours has been very helpful! This tut helped me a lot, thank you henrik! When you first drag and drop a sample into the Kontakt window, it will create a new Instrument where the sample is mapped across the entire keyboard. We need to change this for the original sample. My knob(slider) picture doesnt move and isnt controlled by mouse. I used the exact code for the mouse behavior above. did you remember the empty line in your .txt file for the knob image? Nicee tutorial how can i change the size of the knob ? And how to move the knob i only the the knob and the other frames ?? How can i change the size of the knob ? I suggest you create the knob in the size you want it. Please check knobman for details on how to generate knobs. Why don’t you make a tutorial on youtube i know for sure they gonna watch it! My knob is working in the sense of mouse interaction but the frames move up vertically as I increase the value with my mouse? Its almost as if the PNG isn’t being split into individual frames but more a long strip moving up on a vertical axis. I am not sure exactly what happens here, and how it happened. My immediate advice is that you double check that the txt-file that accompanies your png-file is correctly formatted and sets the correct number of frames. Hey this was incredible. I’ve successfully added a second knob, and now instead of having them apply to pitch, how can I apply them to instrument bus volumes (Bus 1 volume for the first knob and Bus 2 volume for the second)?